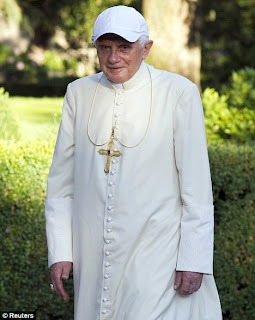 It's so hot even the pope's been slumming it, though the Daily Mail calls it "stylin.'" Good news and bad news at the Vatican website. On the plus side, remember that fantastic wrap-around virtual tour of the Sistine Chapel? Now there's the same for all the Papal Basilicas and Chapels. Cool beans. I'm a bit miffed at the re-working of the Benedict XVI page. Instead of categorizing his spoken and written words (Angelus, Encyclical, speech), they have a calendar of his activities only --and at least so far only 2010 available. So when I want to see what he said to the Swiss bishops in 2006? Bah. This puts a serious crimp in my Ratzingroupie-ing style. Put perhaps the redesign isn't yet complete. His September visit to Great Britain's on the horizon. Too much commentary about that, but here's a whole site dedicated to it. France: Fr. Samir on the burqa ban. Prop 8, the Catholic angle: Apart from Judge Genius' abolition of marriage, he also cites Card. Ratzinger's document on homosexuality as part of the "finding of fact" that religious belief in the harmfulness of homosexuality harms gays. Orthodox adherence to any major religious creed is an affront to the 14th amendment rights of homosexual persons! This is how a bishop serves, not by being served through compromise or taking the easy way out, not by being served saying only what people want to hear or what makes them comfortable, striving to be popular. As Pope John Paul II wrote, the truth that we teach “has its origin in God himself … (but) people can even run from the truth because they are afraid of its demands (Fides et ratio, 7; 28).” Christians cannot run from the truth for this reason. Nor can the bishop. This is how he serves.